or a see through bikini this post is just for you. So once again I have teamed up with Rosegal to bring you a few more wardrobe pieces you might want to add to your closet as summer approaches.I really have been doing alot of shopping at Rosegal and as a result will be showing you the stuff I got that I've been wearing .While I'm here trying to dress appropriately for the ever unpredictable weather this way , I am also in full consideration of the fact that some of my readers are experiencing the beautiful summer weather hence the inclusion of bikinis because a lot of swimming is going to be happening over this period of time.So Rosegal as usual has affordable stuff which can usually be shipped worldwide.The stuff is of great quality.At least I can attest to that being a frequent customer of theirs.I just love the fact that their see through bikinis are tastefully made and show just enough. So the summer wardrobe is amazing if we're talking colors and print and there's also great stuff for vacation.There's also great office wear and great casual clothes up there for this season and generally for whatever weather you are facing.So guys, remember to shop shop shop at Rosegal. You've got some really cute pieces here, girlie! I especially love that blue floral printed dress, it's absolutely beautiful and so elegant. Thanks for sharing and I hope you have a great weekend ahead! Great selection! I love the floral one. 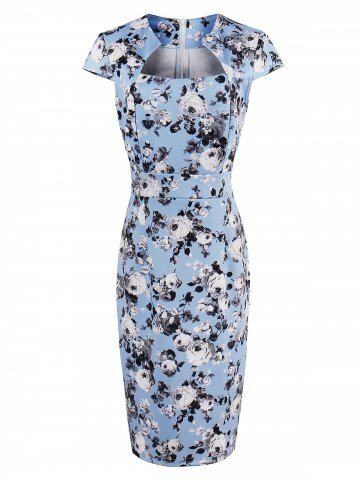 Pretty blue floral dress! Summer here is just starting to warm up enough for swimming. (Northern California) Although its easily year around soaking in a heated bubbly Jacuzzi, therefore I am always in need for a cute swimsuit and I do Love the swimsuit recommendations! Always love this time of year! Have an amazing week! I love all your pieces babe! !